Before demolition, Martha Manor in its last days. Photo by SDHA resident Bennie J. Riley. We were used to them, in a sad kind of way. 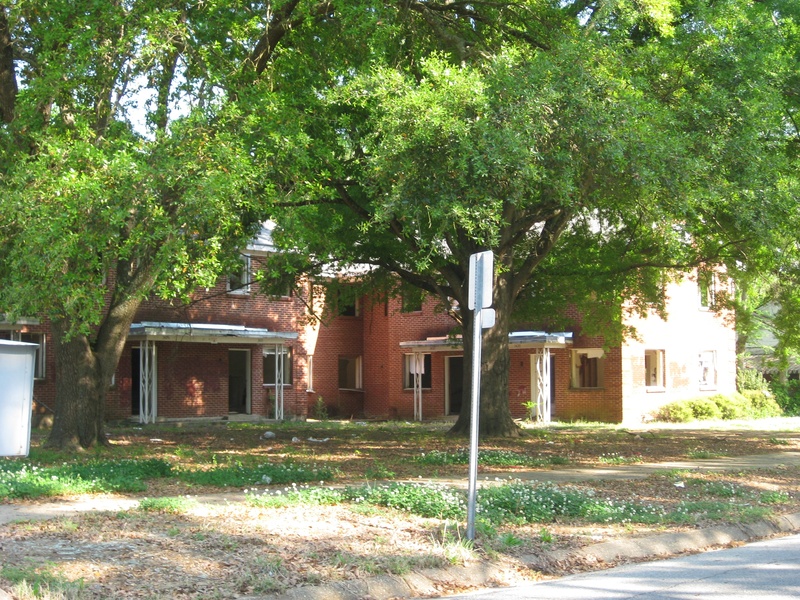 The Martha Manor Apartments on Wilmington were a kind of neighborhood landmark. And not in a good way. The apartments were long-abandoned, desolate, scary and certainly not the kind of place you’d want to be walking near at night. The words “NO COPPER” were scrawled across one outside surface, discouraging further scavengers from ripping up walls in search of metal. The windows that weren’t boarded up? Broken out. Weeds were knee high and scorch marks were reminders of some previous fire. One friend described it as the perfect place for someone to drag a victim, while another joked that we should nominate it for Montgomery’s Most Likely Corpse Disposal Location. We didn’t envy our neighbors in South Hull for having to live near such an eyesore. As businesses began to spring back to life at the troubled corner of Norman Bridge and Edgemont, Martha Manor loomed over them like a reminder of civic decay, of the city’s struggle to thrive despite considerable adversity. And then, one day, they were gone. We were shocked. How did this happen? Who was behind this much-needed masterstroke of neighborhood improvement? The more we looked into the matter, the more impressed we became with the perseverance, over nearly a decade, of our dedicated neighbors in the South Hull District Association (SHDA). Of course, Martha Manor wasn’t always a creepy blight on the community. No place ever starts out that way. By nearly all accounts, the apartments were well kept for a long time until they went downhill in the 1990s. In December 2001, the city was called out to inspect the property because of a report that water was gushing out of the second story of one of the two buildings. The city’s inspection found that the apartments were extremely dilapidated. The battle to clean up South Hull was joined. Using the City’s formal procedure, a letter was sent to the property owner insisting that the apartments be brought up to code. When the owner failed to take the necessary steps, the City Council began a debate over demolition. That’s when then-newly-minted City Council Member Martha Roby got involved. When Roby took over from her predecessor, Alice Reynolds, the Council was first beginning to consider authorizing the demolition of the property. Demolition was finally approved in August 2007, but then there was little action because the order was appealed. The west building was torn down a few years ago, but there was some talk about improving the remaining building. The SDHA reports that the property’s owner even attended an SDHA meeting to talk about plans for renovation. There were some improvements made to the remaining building, but with no property manager on site, they didn’t stick, and once again demolition was on the table. The property owners wanted to sell, so the city gave some time for potential buyers to come forward. None appeared. Finally, in April, the ruins of Martha Manor came down to great acclaim among the members of SDHA. Even though the property wasn’t technically within the boundaries of their neighborhood, the association had come together to improve their larger community. “The destruction of Martha Manor will benefit our and neighboring communities by helping to eliminate the foot traffic coming from an area where suspected illegal activities occurred and hopefully decreasing the break-ins in our areas,” said current SDHA President Lauren Dunning. Roby emphasized the importance of Montgomery residents knowing and using the established city process when they have concerns over properties. The future of the site is unknown for now. SDHA residents are hoping that there might be some momentum to make the lot a neighborhood park, but everyone agrees that it is better to have a grassy lot than abandoned buildings where trash is dumped or act as a haven for criminal activity. During demolition. Photo by SDHA resident Bennie J. Riley. After demolition. Photo by SDHA resident Michael Falzone. The grassy lot where Martha Manor used to be. Download the latest SDHA newsletter here to read more about the story and get the latest news from South Hull.